The Connectivity dialog now uses three pages, one for "Bonds" (i.e. strong connections), a second for H-bonds and a third one for non-bonding contacts. The "Bonds" page is in principle what already know from previous Diamond versions, whereas the other two pages serve to define H-bonds and contacts definitions between atom group pairs or atom site pairs or special element combinations. 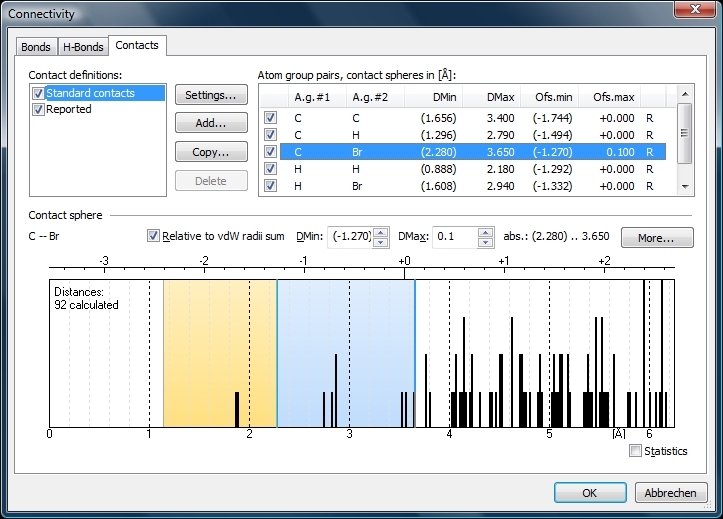 The first screenshot shows the "Bonds" page with bonding spheres for all atom group pairs in the compound COD:1501635 (Ulrich Darbost, Janie Cabana, Eric Demers, Thierry Maris, James D. Wuest; CheM, 1 (2011), 52-12369). The small green ticks below the zero line show bonding parameters, which are usually imported from CIF "_geom_bond_xxx" loops. 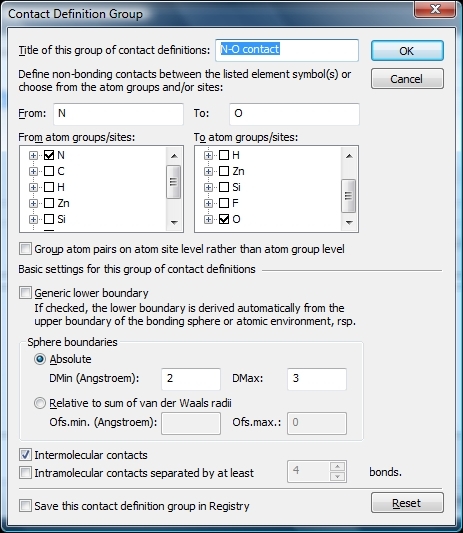 The second screen shot shows the standard (non-bonding) contacts, which are compiled on atom group level -- as the bond groups on the "Bonds" page do. 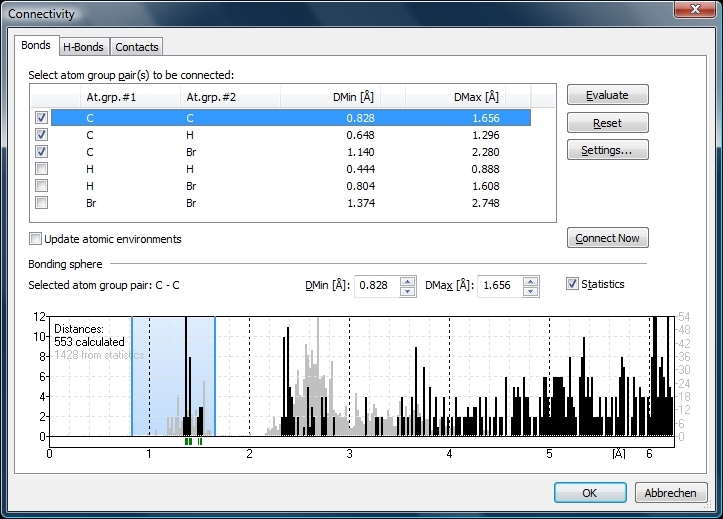 The pair C--Br is highlighted, the histogram shows the distances between all C and Br atoms in the current compound. The light blue rectangle describes the contact sphere and begins on the upper boundary of the strong bonding sphere and ends at the sum of van der Waals radii plus 0.1 Angstroem. Boundaries can be defined in absolute (Angstroem) values or relative to van der Waals radii sums. You can define multiple contact definition groups, the "Standard contacts" are created automatically by the program - independent if there are contact parameters in the input file or not. 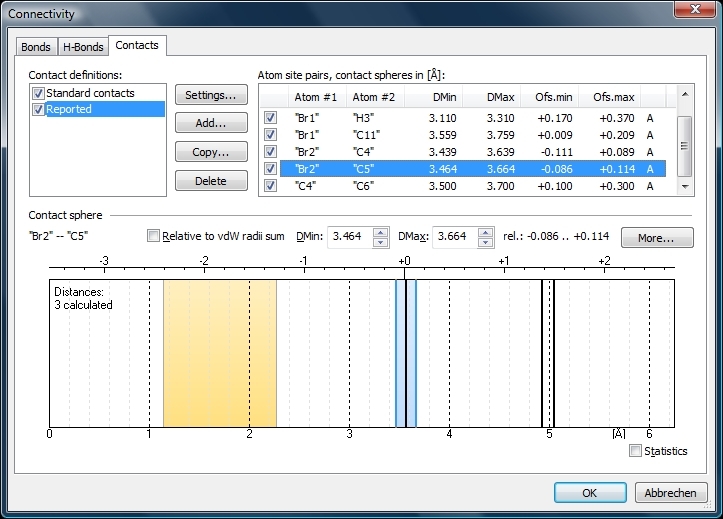 The second contact definition group "Reported" has been derived from the contact parameters (i.e. typically from _geom_contact_xxx loops), and the atom pairs are given on atom site level -- e.g. as highlighted here -- contacts between "Br2" and "C5".